The Starlight Run and Parade holds for a moment as TriMet buses and trains are allowed to cross at W. 5th and Burnside. The Rose Festival is full steam ahead this week and our TriMet crews are busy at work to get riders to and from the festivities. 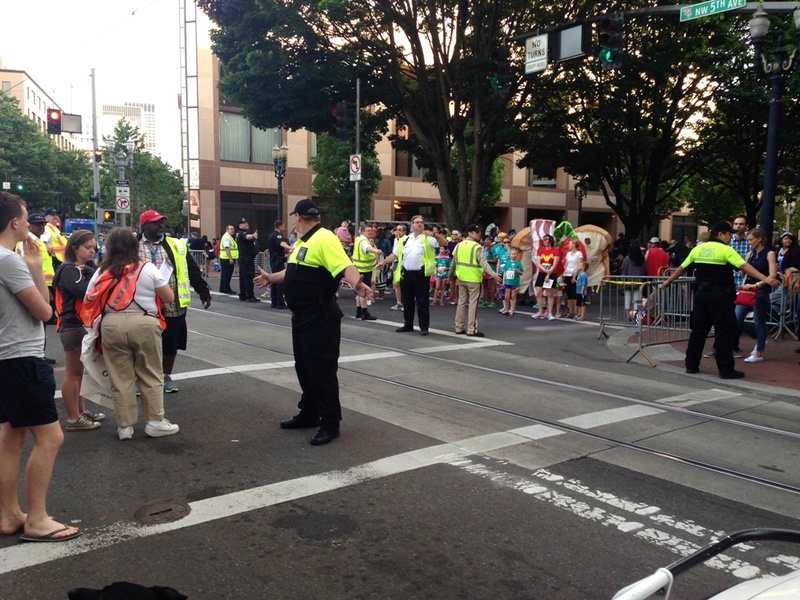 Last weekend’s Starlight Run and Parade day brought out parade goers in droves and TriMet saw ridership increase 30 percent on parade day over a typical Saturday, with MAX ridership up 50 percent and bus trips up more than 15 percent. TriMet provided some 271,000 rides on Saturday, which was up some 14,000 trips over last year’s Starlight day. – Today, June 3 around 1 p.m.
– Wednesday, June 4 around 3 p.m.
– Thursday, June 5 between 2:30 p.m. and 6:30 p.m.
Our most important tip to riders is plan ahead. Plan extra time if commuting across the Willamette River the next few days as the ships arrive and on Monday morning, June 9, as the ships depart. Please be patient. All MAX trains will be stopped for Steel Bridge lifts as the ships pull in and leave. Buses that travel across the Broadway, Steel and Burnside bridges will also experience delays as they detour to other bridges. Consider taking other bus lines that cross the river using the Morrison, Hawthorne and Ross Island bridges. TriMet Field Operations crews will be monitoring the lifts and adjusting service as necessary. The Grand Floral Parade runs from 10 a.m. to 2 p.m. on Saturday, June 7. TriMet is preparing for another big ridership day as the weather is expected to be perfect for parade watching. Twenty bus lines and all MAX lines serve the Portland City Center. They will run on Saturday schedules. There may be some long lines for MAX trains immediately following the parade, so please be patience. Avoid bringing big strollers on MAX. As the trains get crowded, those with a big stroller may have to wait. The same goes for those with bikes. Fares are required in downtown and elsewhere on the TriMet system. Go mobile! Download the free TriMet Tickets app to buy fares for your family. No need to keep track of your tickets; they’re stored in your phone. Learn how easy it is at trimet.org/mobiletickets. Whether using the mobile ticket app or making a purchase in person, buy a Day Pass. It’s the same price as two 2-hour tickets. TriMet staff will be at several MAX and bus stops to provide help and sell tickets. Stay safe by staying aware around our buses and trains. Don’t cross against the light or get distracted by your smartphone. Our operators will be watching out for you, but please watch for our vehicles too. Protect your stuff when in big crowds. Stow your electronic devices and be aware of your surroundings.